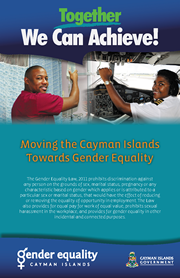 The Cayman Islands Government’s request to have the Convention on the Elimination of All Forms of Discrimination against Women (CEDAW) extended to the Cayman Islands has been granted by the United Kingdom, the Ministry of Gender Affairs has announced. The decision is the culmination of a 12-year quest to receive the treaty with the last application being made in 2013 to the UK Government Equalities Office via Her Excellency the Governor, Helen Kilpatrick, CB, on the eve of Human Rights Day (10 December). Commitments have also been made at various Overseas Territories Consultative Council meetings by the Cayman Islands Government to continue to work towards the extension of CEDAW, and the passage of the Gender Equality Law, 2011, which came into effect on 31st January 2012 was a major step forward in the process of meeting the UK’s requirements for CEDAW extension. 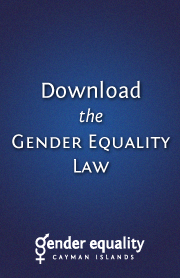 The Gender Equality Law, 2011 prohibits discrimination in employment and related matters and also serves as local “enabling legislation” that upholds the principles of CEDAW. The only British Overseas Territories in the Caribbean to have CEDAW extended up until now were the British Virgin Islands and the Turks and Caicos Islands. Extension occurred in 1986 in both Territories, when the UK ratified CEDAW. It is anticipated that the Cayman Islands will be granted the extension next week at the 60th Annual Commission on the Status of Women meeting at the United Nations in New York. Minister Rivers will be on hand when the UK delegation deposits the instrument which formally notifies the United Nations Secretary-General that the UK Government requests the extension of CEDAW. She will also be attending the Ministerial sessions and the UK led and other side events on topics such as girls and STEM and the gender pay gap. Often described as an international Bill of Rights for women, CEDAW was adopted in 1979 by the UN General Assembly and has been ratified by almost every single member of the United Nations. 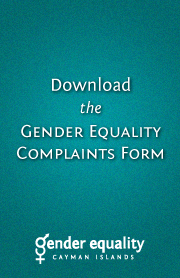 For more information on CEDAW please click here.